Positioning their A-Frame in the ditch while preparing the guylines, and lashing the walkways to the transom. Lashing the transom to the legs and putting tension on a guyline. Positioning their A-Frame and hammering stakes in the corners of the walkways. Lashing on the transom to the legs. Lashing on the ledger and holding the A-Frame up while adjusting the height of the transom. The Shear Lashing at the top of the legs, and lashing the ledger at the bottom. Lashing the A-Frame legs with a Shear Lashing, and lashing on the transom. Carrying their A-Frame to the ditch and placing the walkways on the transom. Lashing on the transom and attaching the walkways. Tightly frapping a Square Lashing for the transom and working together to join the walkways to the A-Frame. Strop lashing the walkways to their A-Frame. 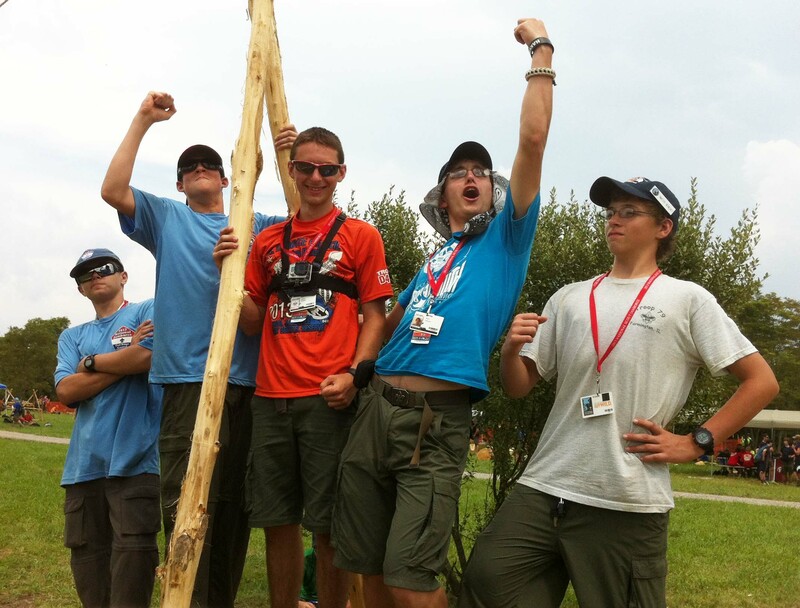 On occasion, a pair of Scouts wanted to build a bridge, and with persistence, and the help of staff or friendly Scouter, they were able to get it done.